American physician and health-food pioneer whose development of dry breakfast cereals was largely responsible for the creation of the flaked-cereal industry. From New Dietetics: What to Eat and How (1921). Yes, it is “that” Kellogg — John Harvey Kellogg, whose interest in healthy eating led to the Corn Flakes product. He was a physician, interested in the best nutrition for his patients at the Battle Creek Sanitarium in Michigan. Based on the food developed there, it was his brother, William K. Kellogg, who was the businessman that began commercial production of breakfast cereal as the Battle Creek Toasted Corn Flake Company (1906). Life has been likened to a consuming fire—a flame. One of the chief functions of food is to serve as fuel by the burning of which the animal heat is maintained, and the energy required for every sort of bodily activity is supplied. 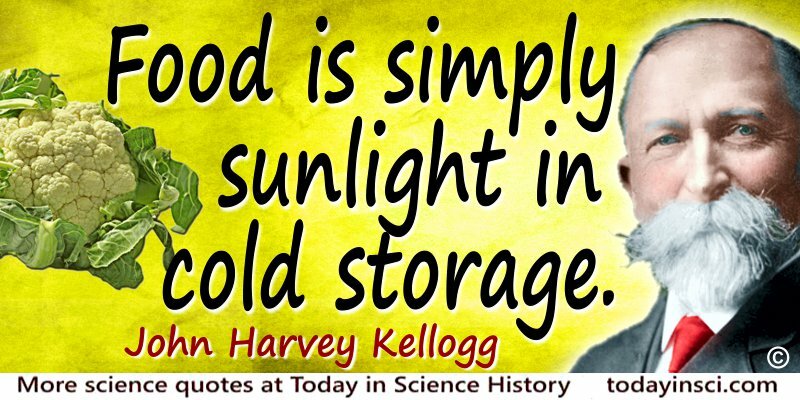 Science Quotes by John Harvey Kellogg. 26 Feb - short biography, births, deaths and events on date of Kellogg's birth.